When Timothy Zahn, the mastermind behind one of the greatest villains in the Star Wars universe, Thrawn, spoke at Comic Con Revolution Ontario recently, he revealed that he still had two more books to write. 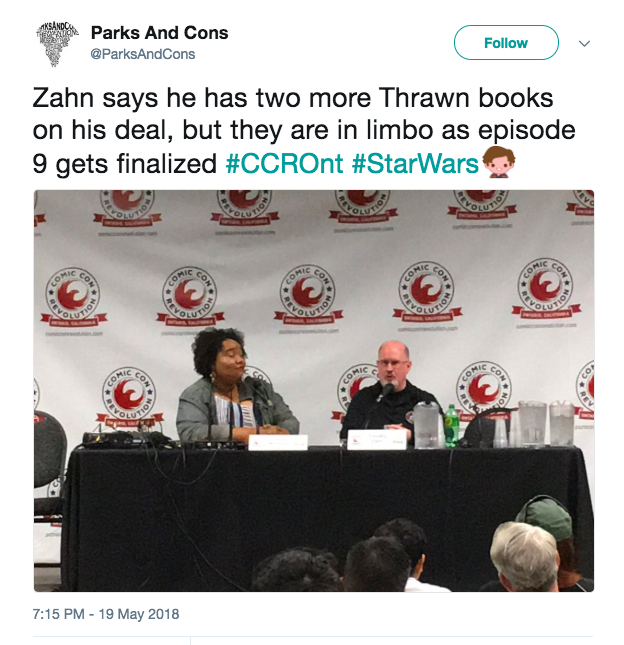 Zahn played an integral role in canonizing Thrawn in Star Wars: Rebels, and in addition to last year's Thrawn novel and its comic adaptations, and this years' Thrawn: Alliances, Zahn appears intent on adding two more novels to what we might call the Thrawn tetralogy. Here's the thing though: he has to wait until the script for Star Wars: Episode IX to be finalized before he can begin working on the stories. This makes sense, since the stories are to be set between Thrawn's disappearance at the end of Rebels and that largely gray area of history between Return of the Jedi and The Last Jedi. This is why Lucasfilm Story Group has him holding off for now.